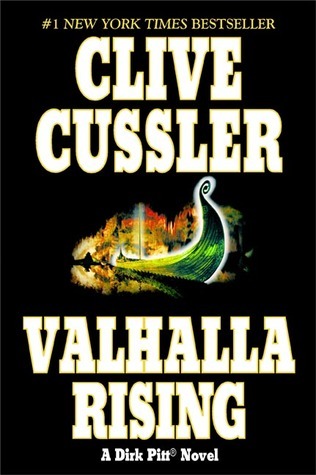 In author Clive Cussler’s sixteenth Dirk Pitt novel, Valhalla Rising, Dirk aboard a NUMA ships spots a ship on fire, and when they race to her aid they are confronted with the horror that has become the Emerald Dolphin a curse ship on her maiden voyage with thousands of passengers on board her facing a fiery death. When the ordeal is past and Dirk is sent to investigate after the ship sinks—the question that goes through everyone’s head is why the Emerald Dolphin’s fire-control systems work and is it possibly linked to the new and revolutionary engines that powered the ship. Was it a terrorist act? During the investigation Dirk is put through hell and though he comes out a live once again everything has changed now. Another wonderful Dirk Pitt novel! It has been quite some time since my last Dirk Pitt novel but I was pleasantly surprised to find that it felt like I had only read it just the other day. As with all the past Dirk Pitt novels Cussler gives us more than one main plot to intrigue us that are somehow wound up together. That also holds true for this book as well in the form of Vikings in 1035 and mystery submarine sighted in 1894. We get quite a few characters that we have become familiar with in past books—Admiral Sandecker, Al Giordino, Congresswoman Loren Smith and St. Julien Perlmutter. All wonderful characters that is very ingrained into this series by this sixteenth book, especially the first two. The ending of this novel far surpasses any of the others I can not say why without giving the whole things away but I will say this—someone Dirk loved more than anyone kind of comes back into the picture and Dirk’s life—and the life of this series I believe—has changed forever. Action packed, suspense filled and all around another great novel in this series—a must read for Dirk Pitt fans, if you have not picked it up yet but read all the previous book in this series, then I beg you—pick up this one! The ending alone makes it worth the read.